The results of last year's District 3 javelin competition had bothered Biglerville's Ben Hurda for most of this past year. SHIPPENSBURG - The results of last year's District 3 javelin competition had bothered Biglerville's Ben Hurda for most of this past year. After qualifying for the state tournament in the javelin as a sophomore, Hurda missed the cut last year when he finished in third place by one inch. Coming into his senior season, he was determined not to let the same thing happen again. At the District 3 Track and Field Championships on Friday, Hurda made it clear from the start he would be going back to states. The top seed dominated the javelin competition and finished first with a score of 180-01. Camp Hill's Carson Twiford finished second with a mark of 162-01. Despite picking up a gold medal, Hurda barely broke a smile on the medal stand and kept things in perspective afterward. 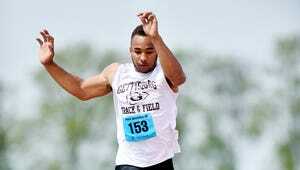 "I definitely want to do better at the state meet so I can get a medal there," Hurda said. "There's plenty or other better people in other districts, people who break 200. I'm not the best in the state by any means but hopefully I can get top eight next week so I can get on this podium again." Having set a personal record last week at the YAIAA championships by throwing a 185-11, Hurda knows his performance on Friday was not his best. But while his main goal is to finish in the top eight at the PIAA championships next week, he said he was still happy to have finished first at districts. The senior got off to a strong start on Friday by registering a 176-0 on his first throw in the preliminary round. His final two throws in the preliminaries dropped below 170 but he came on strong in the finals and broke 180 feet with his final throw. "I wanted to get a PR today but I still got first so I guess I'll settle for that," Hurda said. "It feels good because I made states as a sophomore and missed it last year, and I was pretty upset. To win gold this year feels good." Dorsey shines in 100-, 200-meter dash: Delone Catholic senior Tavian Dorsey isn't afraid to set high goals for himself. After qualifying for the PIAA championships in the 100-meter dash last season, Dorsey entered 2016 determined to make states in multiple events as. On Friday, he took major steps in making that goal a reality by shining in both the 100 and 200-meter dashes at the District 3 championships. Dorsey got off to a fast start Friday by setting both a Delone Catholic and personal record in the 100 with a time of 11.07 seconds in the preliminary rounds. He then guaranteed himself a spot in Saturday's finals by finishing first in the semifinals with a time of 11.13. Seeded fourth in the 200, Dorsey finished first in his heat and third overall with a 22.88. Those times put him in a solid position to qualify for states in both events Saturday by finishing in the top two. "I feel tired but I also feel great," Dorsey said. "I'm just glad I made it to the finals in both. I really didn't take it that seriously last year, but this year I'm putting the work in, practicing non-stop and working on my starts. It's paying off." Dorsey admitted that being seeded high made him nervous going into the day. At the same time, he said it's better to be ranked high and know you're capable of winning than being seeded near the bottom. And having finished higher than his seeding in the 200 on Friday, the senior is confident he can do it again on Saturday and sneak into the top two Saturday. "It's so much pressure, it's a good thing because you have the top time but you also have so much weight on your back," Dorsey said. "I don't really worry about it. (Finishing third in the 200) proves that rankings don't matter, if you try your hardest you can do as well as you want." YAIAA runners miss states in 3,200-meter: Going into Friday, it seemed like Biglerville's Daniel Wood and Delone Catholic's Will Greene were set to challenge each other for a spot in the PIAA championships in the 3,200-meter run. With Wood and Greene seeded second and third respectively, it seemed surprising that both would fall out of the top two and miss the cut. But that's exactly what happened in Friday's second-to-last event, as Greene finished fourth (10:01:93) and Wood fell all the way back to seventh (10:11:97). While Green's time was only two seconds off of his previous best of 9:59:19, he was passed by top seed Cooper Leslie (Camp Hill), fifth-seed Billy Webber (Boiling Springs) and seventh-seed Brenden Miller (Upper Dauphin). Green admitted he was extremely disappointed to miss states his senior season. "Mixed feeling for sure, I was really hoping to make states and unfortunately I didn't have it today," Greene said. "I felt really tight during the race. I was loose coming in and I wasn't anticipating it was going to slow me down as much as it did." Greene can still qualify for states Saturday if he finishes in the top two in the 1,600-meter race. He enters that race seeded fifth. Despite Friday's disappointing performance, Greene said he can't complain much about his high school career. "Just having the ability to run is a blessing," Greene said. "I've got so many blessings, I've just got to count them."